Jasmine Gipson has long considered a career in teaching. Her mom has been a teacher for almost 20 years, and Gipson is familiar with everything the job entails — including low pay and long hours — and those factors haven’t scared her off. “I’ve seen how she’s navigated through those things and taken advantage of the benefits she’s received, so the idea of teaching doesn’t seem as scary to me as it might to other people,” Gipson said. Even so, she won’t be teaching this fall after she graduates from Harvard with a degree in African and African-American Studies. She hasn’t taken a teaching career off the table entirely, but she did say that the politics surrounding teaching and concerns about her potential colleagues have made her hesitate. For now, she’ll be working as a fellow for a nonprofit agency that focuses on increasing opportunities for low-income children. Gipson’s story is one among many in a larger complex trend in education: For a number of reasons, it appears that fewer of our best and brightest young people are becoming teachers. Enrollment in teacher prep programs — both short-term ones like Teach for America and the more traditional college education majors — are on the decline. TFA has experienced a 21 percent decline in applications since 2013; federal Title II data on teacher prep programs shows a 31 percent decline in enrollment since 2008; and enrollment in graduate education programs has decreased by about 3 percent annually since 2008. These application and enrollment drops have been well documented by the likes of the New York Times, NPR and Education Week. Marder added that people who may consider teaching later in their careers have been deterred as well. It’s likely that the drop in enrollment in teacher certification programs is just a blip on the radar resulting from the recent economic turmoil. 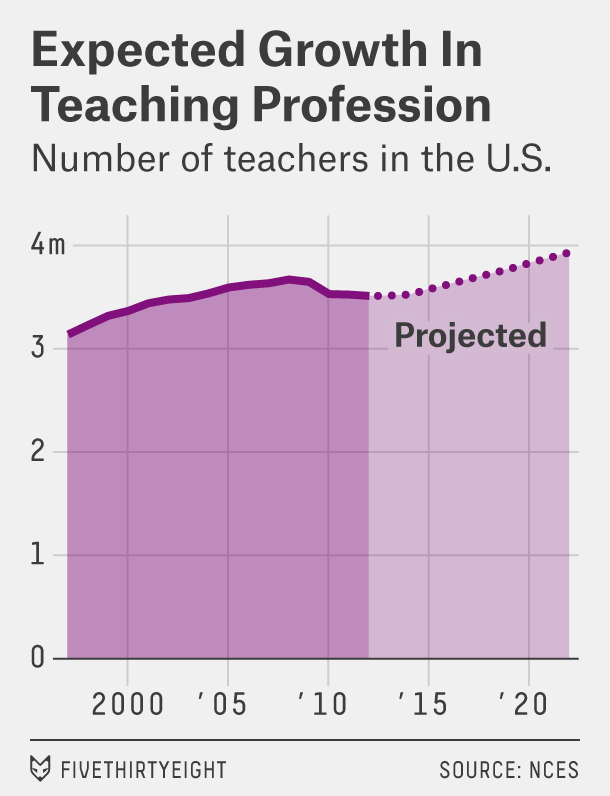 Economists seem confident that the number of teaching positions will continue to grow; the National Center for Education Statistics’ annual projections show that the number of teaching positions is expected to increase by about 1 percent every year through 2022. But whether or not enrollment numbers rebound, the recent trend has reignited a discussion about who is choosing to become a teacher and, just as important, how good those people are at what they do. Kate Walsh, president of the National Council on Teacher Quality (NCTQ), a nonpartisan research and policy organization, believes that the dip in enrollment in teacher training and education programs might be a good thing. With the rebounding economy, it’s possible that many students who were interested in teaching for job security in the midst of the recession have siphoned off to other pursuits. “If it’s less academically able students who are choosing not to go into the profession, that would be solving a problem that we have,” she said. That concept — that not all teachers are equal — has long been a political sticking point. The federal government has focused on tracking teacher quality in the hopes of improving standards, especially since the implementation of No Child Left Behind (NCLB). Part of the legislation required that all teachers of core academic subjects be “highly qualified” by the 2005-06 school year, but the government has gotten flak for its amended definition of the term “highly qualified teacher,” which requires only that teachers are “making satisfactory progress toward” completing full state certification. Under that definition, 94 percent of classes in the 2006-07 school year had a highly qualified teacher at the helm, according to the Department of Education’s final report on teacher quality under NCLB. Walsh says these types of standards are one of the main problems facing the profession. While the federal government sets the minimum bar for teacher qualifications, the real onus is on states to implement their own higher standards. 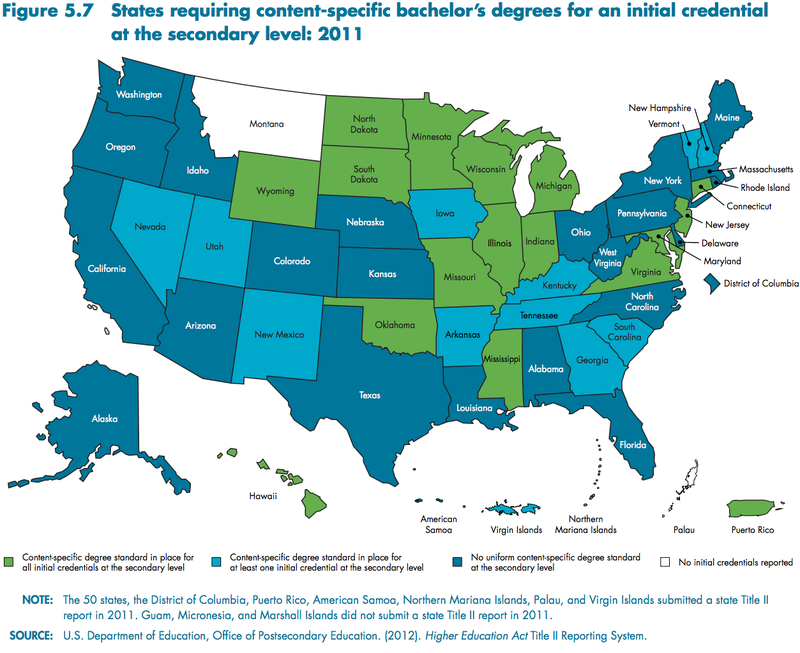 State requirements vary widely: 23 states (including D.C.) don’t have a uniform content-specific degree standard for high school teachers, according to the secretary of education’s most recent report on teacher quality. That means, for example, that some biology teachers might have biology degrees while others don’t. Data from the report also shows that while each state has its own assessment for teacher preparation programs, and its own minimum passing score for those assessments, the national average score cutoff is 56.5, while the national average score of test takers is 71.3. The difference in these two numbers suggests “that the bar may be set relatively low across the board,” according to the report. Cut scores range from 42.6 in Puerto Rico to 70 in Arizona, Illinois and Oklahoma. A 2014 report from the NCTQ shows that there’s also a low bar for education majors throughout their time in school. 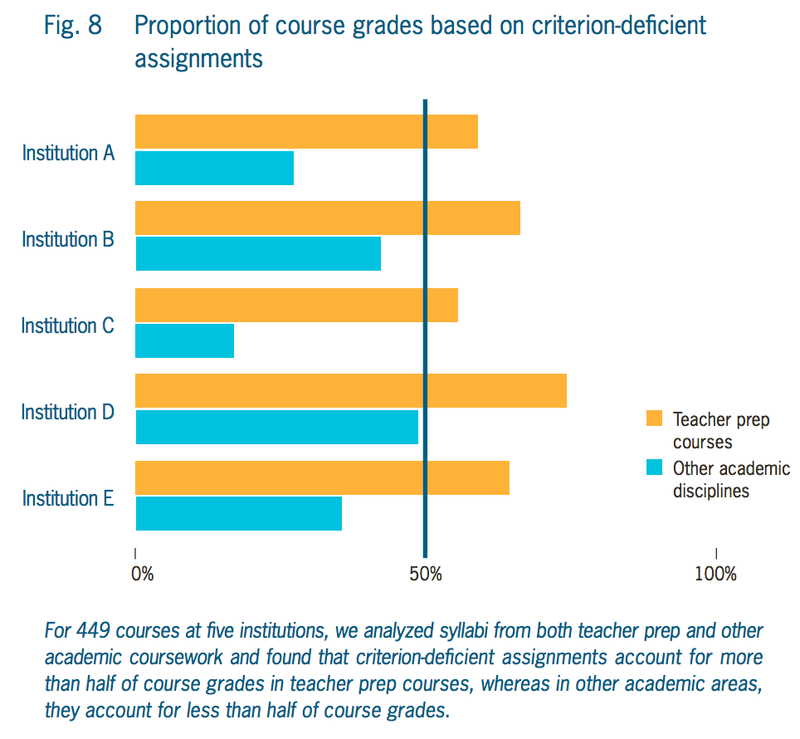 It found that education majors made disproportionately higher grades than students in other majors, largely because grading standards for teaching candidates are much lower than for other majors. “It’s a very easy major. It’s attracting students who are not serious about teaching,” Walsh said. Walsh may have cause to be optimistic about the future of the profession, however: An Educational Researcher study published in November found that the average SAT scores of students in New York entering the teaching profession have been on a sharp rise since 2007, which mirrors the findings of a 2013 national study. 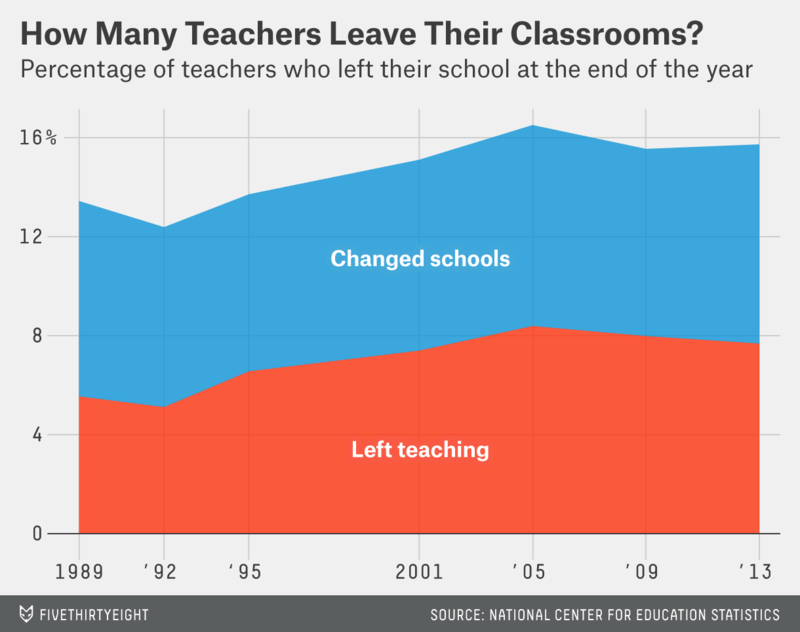 Once these teachers have entered the field, however, they might be less likely to stay in the classroom, according to the most recent data from the National Center for Education Statistics. She did find her way to teaching, but she was quickly disillusioned, and now she’s leaving the profession at the end of this school year. Walsh and Mack agree that to attract the best possible teachers to the profession — and to keep them there — better incentives are key. But improving teacher pay — especially based on quality and experience — is easier said than done. CORRECTION (May 13, 6:57 p.m.): An earlier version of this story misidentified the publication Education Week as Education Weekly.